When you get stressed, hormones such as cortisol are produced by the brain, which prompts a “fight or flight response”, which in turn speeds up your heart rate and constricts blood vessels. Your muscles get tense and you feel anxious. When the event is over the muscles relax, but if the stress is constant, the muscles may not relax and remain in a slightly tensed state. This can lead to chronic neck and back pain, headaches, and joint aches and pains. 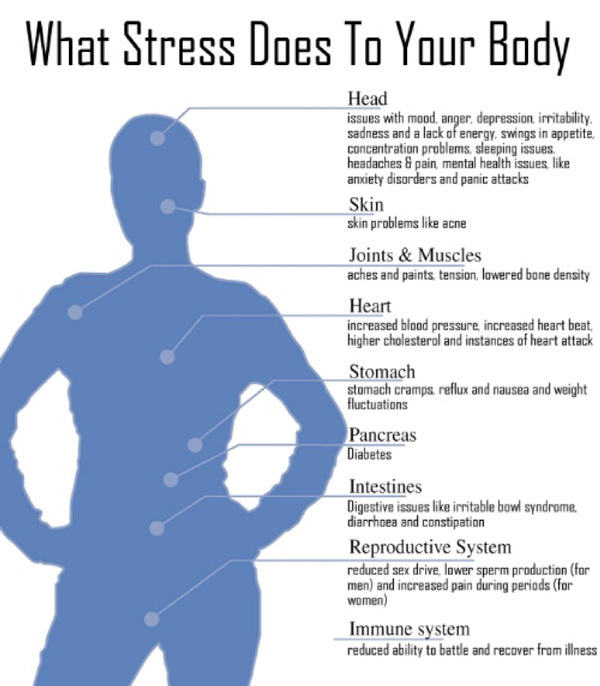 Chronic stress can increase the risk for various health conditions, including hypertension, irritable bowel syndrome, heart attack, anxiety and depression. Managing your stress is the key to an improved quality of life! The following are 3 proven stress-reduction techniques that will help manage your stress. Brisk walking– A 10-15 minute on your lunch break or at the end of your day will calm your nerves and clear your head. Massage Therapy – Get a massage at least once a month! Massage can lower stress levels, help relax tight and painful muscles, enhance circulation, and improve range of motion in the joints. Getting a massage on a regular basis will help control how tense your muscles get between appointments, which improves your quality of life. To book your appointment with one of our Registered Massage Therapists, call: 604-293-7707.